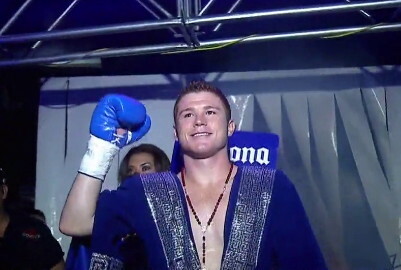 By William Mackay: WBC junior middleweight champion Saul Alvarez (36-0-1, 26 KO’s) battles Britain’s Ryan Rhodes (45-4, 31 KO’s) on June 18th at the Arena VFG, Tlajomulco de Zúñiga, in Jalisco, Mexico. The 34-year-old Rhodes will be Alvarez’s first title defense for the young 20-year-old Alvarez. This could be a tough fight for Alvarez if he’s not smart and doesn’t take the fight to the slick southpaw Rhodes. Alvarez sees himself almost ready for a big payday against Manny Pacquiao within a year. Alvarez is going to have to look really good against Rhodes and for his next fight if he’s going to be seriously considered as a future opponent for Pacquiao. But then again, Alvarez may get a shot even if he doesn’t look great. He’s got to establish himself as a popular fighter in the United States and not just Mexico for him to get a shot against Pacquiao, though. There is talk that Alvarez will be fighting next on September 17th in a fight that will be shown on HBO on the same night as Floyd Mayeather Jr’s bout against Victor Ortiz. Alvarez’s fight won’t be taking place in the same venue as the Mayweather fight, and instead will be in Mexico where Alvarez commands huge crowds for his fights. But first Alvarez has to get by the slick Rhodes and make sure he wins impressively in order to get that big money fights in the future. Rhodes can punch a little but he doesn’t have the kind of power that Alvarez possesses and he’s also mostly fought at the Euro and domestic level his entire career.